Salads are delicious and nutritious meal. They are a great source of vitamins, minerals, anti-oxidants, carbohydrates and a lot more. 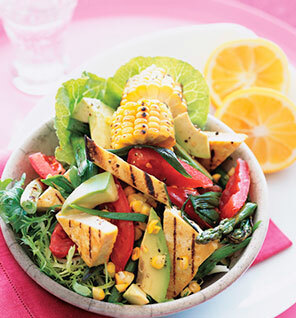 Salads are considered as light meal and much more than an appetizer. Their preparation mostly involves vegetables (leafy vegetables) sometimes fruits or a combination of these. The dressing commonly made is a combination of oil, vinegar, mayonnaise, or lemon juice. Different countries have various types of salad recipes. A salad recipe is easy to make because it does not require heavy cooking or the use of stove or oven at all. These kind of salad recipes are very popular because they are usually served cold. 1. Place the eggs into a saucepan in a single layer and fill with water to cover the eggs by 1 inch. Cover the saucepan and bring the water to a boil over high heat. Remove from the heat and let the eggs stand in the hot water for 15 minutes. Pour out the hot water; cool the eggs under cold running water in the sink. Peel and chop the cooled eggs. 2. Place the potatoes into a large pot and cover with water. Bring to a boil over high heat, then reduce heat to medium-low, cover, and simmer until tender, 15 to 20 minutes. Drain and refrigerate until cold. Peel and cube once cold. To make dressing: In a bowl, whisk together the garlic, anchovy, and salt until blended. Whisk in the lemon juice, Worcestershire sauce, mayonnaise, and water. When the dressing is well combined and to the desired thickness you wish, whisk in 2 tablespoons freshly-grated Parmesan cheese. To assemble salad: Separate the Romaine leaves and discard the coarse outer leaves. Wash, drain, and pat with paper towels or spin dry the remaining leaves. Note: Lettuce should be prepared ahead of time and refrigerated until ready to use. Tear into bite-size pieces and set aside. In a large salad bowl, add the Romaine lettuce pieces and the dressing, a little at a time; toss until coated. To serve: Divide the salad between chilled salad plates and sprinkle each salad with the remaining Parmesan cheese and coarsely ground pepper. Serve immediately with chilled forks. Makes 6 medium-size salads. Recipe found at whats cooking america. Cook eggs, sugar, vinegar, pineapple juice, butter and salt in double boiler until thick, stirring constantly. Cool. Fold in other ingredients. Cook a little before adding cornstarch. If too thick, add a little milk or cream. In a small saucepan, bring the first 6 ingredients to a boil. Boil for 2 minutes, remove from heat, cover and cool syrup completely. Combine the fruit in a large bowl, add syrup and stir to coat. Cover and chill for at least 2 hours, stirring occasionally. Drain before serving. Serves 12-14. Mix all together and let it stand 24 hours. Do not peel cucumber, wash it and chop it very fine. Drain well. Combine it with the remaining ingredients. Wash spinach and drain. Combine and heat-oil, soy sauce, lemon juice and garlic. Pour over spinach. Add eggs on top. Brown ground beef with taco seasoning mix. Layer lettuce, olives, cheddar cheese, onion, tomatoes, ground beef and avocado. When ready to serve, add dressing and sprinkle with chips. Mix all ingredients well. Keep refrigerated. Shake well in jar. Keep refrigerated. Do you like this Money Making Business idea? then please consider subscribing to our RSS feed and have new articles sent directly to your inbox. Previous VIDEO: New year, new trends? .-= ikogsakanding´s last blog ..Jennifer Lopez falls during her performance at AMA (video) =-.